In recent years, National Marine Fisheries Service (NMFS) has taken great steps to recognize the importance of recreational fishing across the nation and their research continues to reveal the substantial benefits that come from healthy recreational fisheries. Surveys conducted by NMFS in 2011 of private HMS angling permit holders revealed that anglers targeting HMS in particular make significant economic contributions because of the high costs of tackle, fuel, and boats required for offshore fishing. It was estimated that private HMS angling permit holders had an economic impact of USD $266 million. However, these estimates were only for private vessels in the Northeast and Mid-Atlantic (Maine to North Carolina) region and previous studies on the for-hire sector have never looked specifically at for-hire HMS vessels. In 2013, NMFS followed up this study with further research to estimate the significant impacts of the for-hire sector for the entire East Coast and Gulf of Mexico. From July to November of 2013 NMFS randomly selected Atlantic HMS Charter/Headboat (CHB) owners from Maine to Texas to collect important data on expenses and earnings for HMS trips. The results showed that the average charter boat fares (6 anglers or fewer) were $2,450, $2,111, and $1,223 for the Northeast (ME-VA), Gulf of Mexico (FL-TX) and Southeast (NC-FL) regions respectively. In the Northeast close to 5,000 for-hire HMS trips were made and are estimated to have generated more than $12 million in direct expenditure, employed 460 people, and a total economic output of nearly $32 million. In the Southeast, roughly 3,000 HMS for-hire trips were taken that generated $3.67 million in direct expenditure, create 243 jobs and a total impact of $10.5 million. Within the Gulf of Mexico, 1,505 HMS for-hire trips were made that generated $3.17 million in direct expenditure, created 428 jobs and $8.8 million in total economic impacts. In addition to asking about trip expenses on ice, bait, and fuel, the survey also asked CHB permit holders about fishing patterns, including species targeted, vessel characteristics, gear used, type of bait, and hook type used. Responses showed that 68% of for-hire trips target multiple species while 32% targeted only coast sharks. The survey also revealed important differences between charter boats and headboats (vessels chartered by 7 anglers or more). 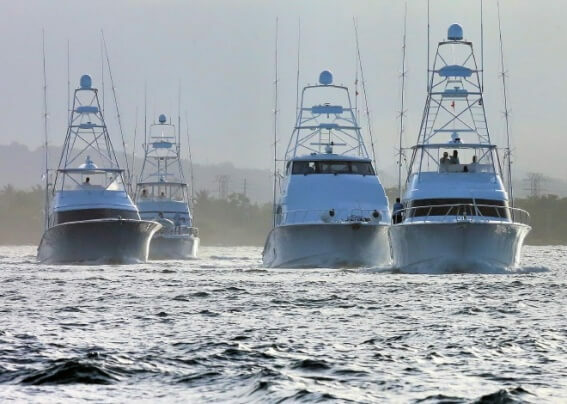 The most common species targeted by charter boats were yellowfin tuna, sailfish, marlin, and coastal sharks compared to headboats that more often targeted bigeye tuna, swordfish and coastal sharks in addition to yellowfin tuna. In total, $19 million in direct expenditure of HMS for-hire trips generated approximately $51 million in economic output for coasts from Maine to Texas. These findings will greatly help represent the importance of HMS recreational fishing when evaluating future management actions and it should be noted that it was only possible by the participation of captains and anglers. This upcoming summer, NMFS will continue to gauge the impacts of recreational HMS fishing through surveying HMS tournament directors and participants. TBF strongly urges any boat owners, captains and tournament directors to take part and stress how vital studies like these are to ensuring the future of recreational HMS fishing. For further information or questions, please contact TBF Science & Policy Specialist, Michael Kelly at Michael_Kelly@billfish.org. Tremendous issues here. I’m very glad to look your post. Thanks a lot and I’m having a look forward to contact you.